We headed to Milan with mixed reviews of the city. I had heard from some that Milan is dirty and very industrialized. We also heard from others that Milan is a very nice and fashionable city. Ok, so we are off to a nice, fashionably, dirty, and industrialized place? Either way, since Milan was conveniently located on the way back to France from Venice, we were willing to make the trip to find out for ourselves. I am so glad we included Milan as part of our road trip. What we found was a very clean, and yes in parts industrialized city, with a wonderful, and again clean, subway system, and quite a lot of amazing sights to see. Our hotel was not in the center of town, but unlike Florence it was still a very nice area. We consulted the hotel receptionist for the best way to get into town. "Subway is the best way", she said. She gave us a map of the subway and a map of the city and told us what we should see. Unlike Florence, where we were really confused about using the public transportation to get to the city center, we had no problem getting to the subway station near the hotel and buying tickets (you can even select English as the language on the ticket machine). The subway system is designed very well, making any needed connections/transfers very smooth. We headed into town to the Brera District to find a good restaurant for dinner. After walking around for a bit, we settled on New Art Cafe. The staff were very nice and accommodating, but the food was just OK. Not to be a food snob, but my seafood salad lacked flavor, the avocados were a bit brown :(, and the steak was nothing impressive. As I mentioned in the Venice post, we were hit again with the table cover charge. After dinner, we walked to the Sforza Castle, which was very closed, so we decided to head towards Duomo di Milano instead. On our way to the Duomo, we came across a lot of signs talking about Expo 2015. "Expo 2015 is the next scheduled Universal Exposition after Expo 2012, and will be hosted by Milan, Italy, between 1 May and 31 October 2015. The theme chosen for the 2015 Milan Universal Exposition is Feeding the Planet, Energy for Life. This embraces technology, innovation, culture, traditions and creativity and how they relate to food and diet." Read more about it here. One of the cool Expo 2015 things we saw was a quantomais (A field of corn). "Over 1,500 corn plants, grown two meters high at Cascina Gambarina Abbiategrasso, and planted over an area of 60 square meters." The field includes more than just corn, we saw a variety of plants as we walked through this small rectangular wonder. We continued our walk on Via Dante, which is a pedestrian only street lined with chic stores, and adorned with flags of every country (for the Expo). When I tell you we really just show up in cities and see where we end up, I am not kidding. We really had no idea what to expect of the Duomo di Milano. We were ready to see a Duomo like the one in Florence, but in a smaller scale. Boy were we wrong! As we approached the Piazza del Duomo, we were awed by what laid before our eyes. To our left we saw the gorgeous arch that is the entrance to the Galleria Vittorio Emanuele II, one of the oldest shopping malls. Right in front of us we saw the magnificent Duomo Di Milano. This Gothic Cathedral took nearly six centuries to be completed. It is the fifth largest cathedral in the world, and the largest in the Italian state territory. There are 3400 statues, plus over seven hundred figures in the marble high reliefs. We admired the Duomo from various angles, and of course the kids enjoyed running after the pigeons. Travel Tip: While near the Duomo, If you are looking for a place to grab a cup of coffee and a pastry, or better yet some ice cream, you must check out Cioccolat Italiani. The shop does not allow photography but it is truly one of a kind and you will not be disappointed! After walking around the Galleria for a short while, we headed back to Piazza del Duomo and enjoyed the view of the white cathedral against the dark sky. Travel Tip: When we arrived at the cathedral it was already closed for the day. But during the hours that the cathedral is open, the roof is accessible to the public (for a fee). A word of advice regarding women's clothing, no shorts, no skirts above the knee, and no tank tops are allowed. I saw no restriction on men's clothing :-/. Did I mention that I am really glad we came to Milan? Similar to the Venice post, in the interest of keeping all the content for Milan together, I will include what we did the next day (August 22nd) below. There was a really nice playground near our hotel, on our way to the subway. We decided to let the kids have fun and play for a while. And guess what? 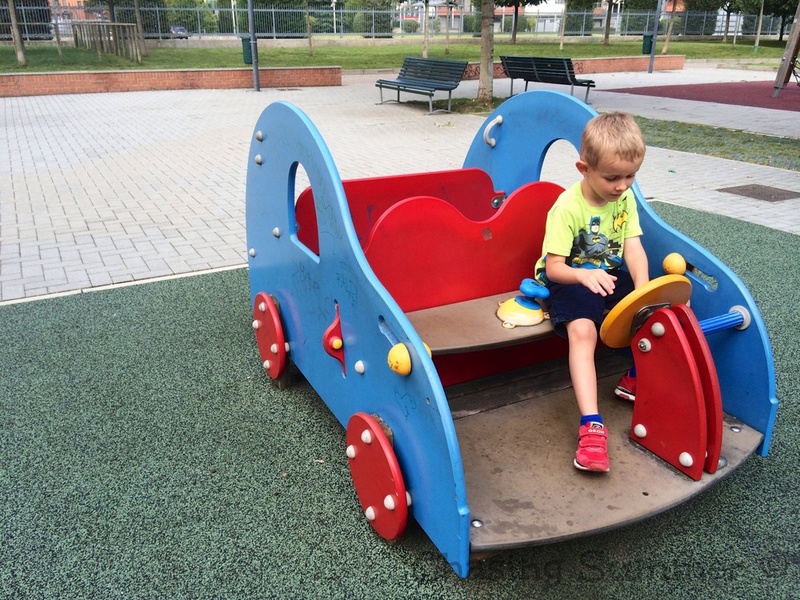 Italian playgrounds have swings! Hurrah! There were multiple fun play sets to play on. It is always hard to peel kids off playgrounds, but we wanted to head into town one more time to see if we can check out the Castle and the Gardens. "The castle, an imposing symbol of Milan under the Sforza's dynasty, is the most monumental vestige of the city's defense system." To be honest, there is nothing beautiful about this castle. It has very high walls and looks like a great building to withstand enemy attacks. There is no fee to get into the castle, but there are various small museums built a long the way to the castle gardens and they each have their own fee. We skipped the museums and headed to the gardens. The gardens are very beautiful and eventually lead to Arco della Pace ("Arch of Peace"), which is located in Porta Sempione. The arch was "initially built in the early nineteenth century as part of the 'Foro Bonaparte' - a modern version of a Roman Forum - to celebrate Napoleon's victories." Read more of the history here. I have to mention that we did see quite a few very fashionable people walking around, but since we did not have time to make it to the fashion district, we probably didn't get to see as many fashionistas as we could have in Milan. We had also heard that Milan is where the Starbucks CEO got the idea of opening espresso bars in the US. We had to try the coffee in Milan. We had a delicious cup at Motta Caffe Bar or as the locals call it, Motta in Galleria. Milan is also home to Da Vinci's famous Last Supper painting, but it is quite expensive and you have to reserve in advance, which we did know about ahead of time but decided to pass on this time around. I am sure there were a lot of other things we could have done in Milan had we stayed longer, but no matter, this short visit left a great taste in our mouths. Ciao Italia. We hope to be back in the future.